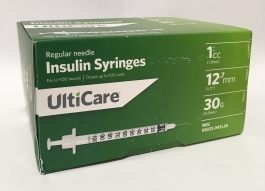 From plunger to tip, UltiCare syringes are precision engineered to make every injection as comfortable as possible. And our premium quality is guaranteed. We help you give it your best shot. Safe disposal is important for safety at home and also helps prevent used needles from entering the waste stream, putting individuals handling the trash at risk for accidental needle sticks.